HomeAnother trip to White Ledge! And Black Fly Hell. Another trip to White Ledge! 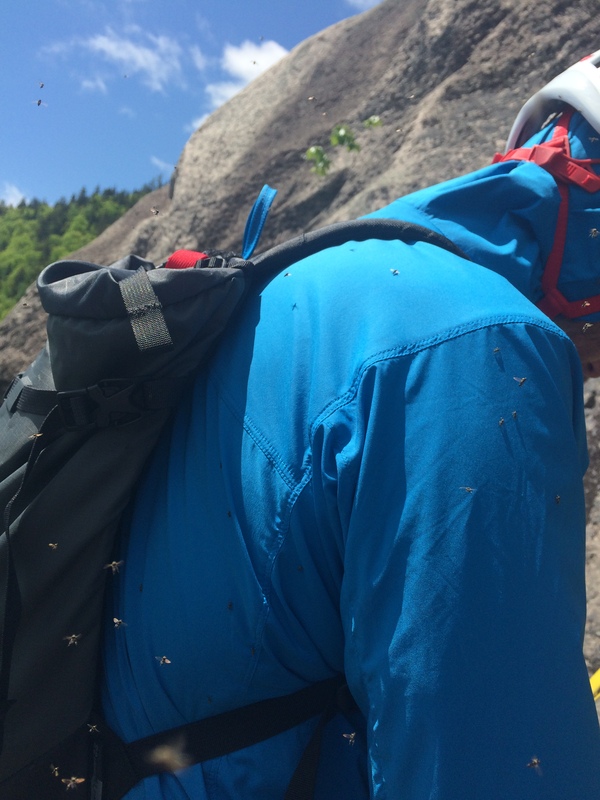 And Black Fly Hell. 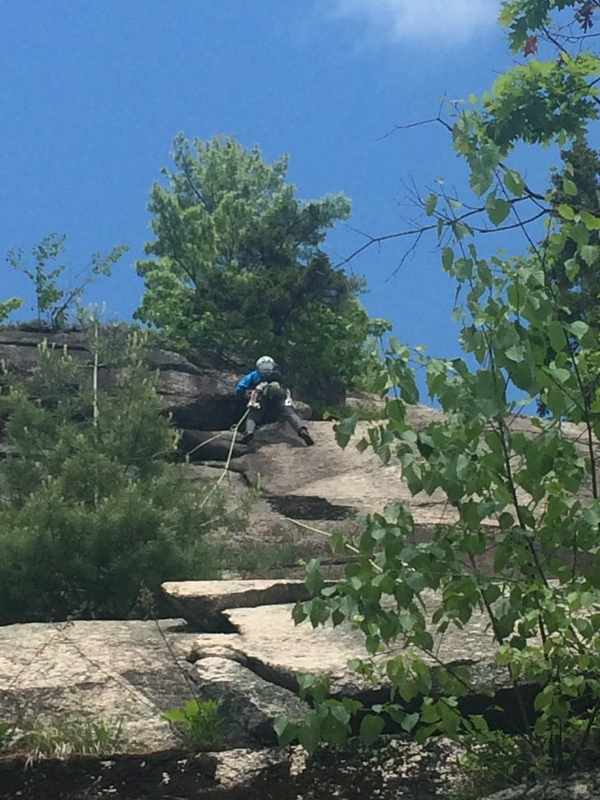 Yesterday I returned to White Ledge in Albany, NH for the third time this Spring. This time paving on Rt 16 made parking at the campground more convenient. After timing the hike out there after multiple trips I think the campground approach is definitely better (as long as it is open). Having climbed almost all the moderate routes on the Main Wall I wanted to check out the Right Wing and East Buttress areas. To get up to the Right Wing I figured we would climb the classic Trail of Tears and then rap down over to the area. 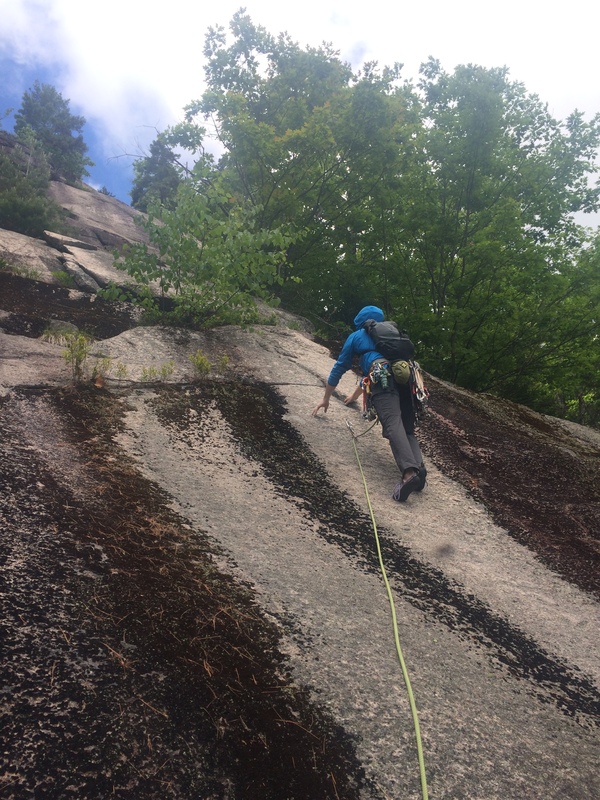 I hadn’t climbed the first pitch of Trail of Tears yet and unfortunately it was seeping wet, so Tom led the first pitch of Manifest Destiny and then traversed up and over to the anchor at the start of the 2nd pitch. I started up the 2nd pitch of Trail of Tears until I could see the whole pitch above the crack was still soaked. I decided to climb the wet mossy ramp to the right and after a bit of groveling in slimy lichen & blueberry bushes reached the anchor at the top of White Riot. After bringing Tom up we scrambled up to the base of the Right Wing and hopped on pitch 2 & 3 of White Wonder. I finished up the easy last pitch and we grabbed some lunch. Despite the gazillion black flies we decided to make our way over to the top of the East Buttress and see what we could find. 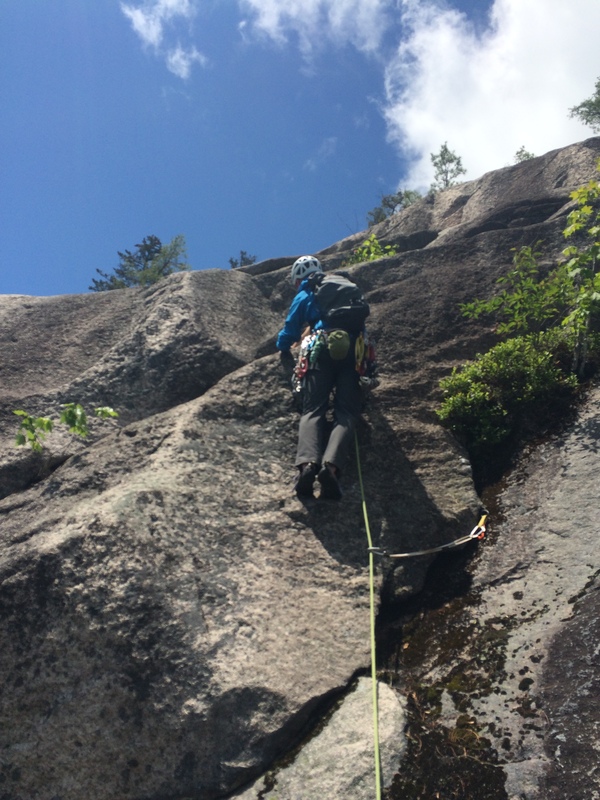 Rapping from an obvious pine tree at the top of the buttress I located Shista and Chasing the Sun to our left. We only had one 60m rope so I stopped on a good sized ledge 100 feet down and we built a quick gear anchor. We then climbed back out a variation (I think) of Out of the Forest, just to the left of Men in Bright Lycra. It’s a balancy step left around this rounded arete to gain an easier ramp up to a very cool eroding Quartz Pocket & Dike. I’m going to ask Brad White if this was part of his recent route, Out of the Forest. We topped back out and made our way out to the White Ledge hiking trail which is really easy to pickup from the top. We took a left and climbed up over the top and back down to the campground, which took about 48 minutes. The views from up there give some great perspective on the Kancamagus areas. Found & Lost Ledges, Sundown, Rainbow, Eagle, Hedgehog, all look quite enticing from the backside of White Ledge. I think I’ll be spending a lot of time out there this season… once the Black Flies die down! Tom is a bit of a purist when it comes to bug repellent. He survived the day without wearing any, where as I applied 30% DEET 3-4 times. Tucking his lightweight shell hoody under his helmet along with pants can make it reasonable. I have never bought a head net but was thinking one would be great on a day like that. What strategies do you use? Au-natural? 100% Deet? Permethrin? Only ice climb? Share in the comments below! The bugs. Oh, the bugs. But what a great little cliff! Whoa, total weirdness. Replied twice by accident and the link to my “website” goes to a site that I not only didn’t specify, but that is so old I forgot I even HAD that site. That’s ok! Do you want me to remove one of the duplicates? If the Dadstoryproject isn’t active anymore I’ll remove that one. I remember checking that blog out not so long ago! You convinced me to wait a week or so more before going out there this spring. Weighs nothing and I don’t care how I look, if they get that bad again I am putting it on!